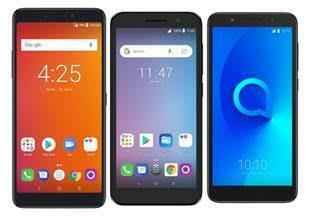 Alcatel has launched three new handsets with Telstra, the Alcatel 1X, the Telstra Superior Powered by Alcatel, and the Telstra Essentials Plus Powered by Alcatel. All three handsets are priced under $200. “There is growing demand for compelling sub-$200 alternatives, with more Aussies than ever before appreciating that you can buy a lot of tech for very little,” said Sam Skontos, VP and Regional Managing Director of South East Asia and Pacific Alcatel Mobile. The Alcatel 1X is powered by the Android Go operating system. The phone has a 5.34-inch screen, an 8MP rear camera and a 5MP front camera. The Alcatel 1X will be available in Dark Grey Suede from 4th September for $129. The Telstra Superior has a 6”-inch 2K screen. It features dual rear cameras consisting of a 12MP camera paired with a 2MP secondary depth camera with LED flash. The phone runs on Android Oreo and has a 3,000mAh battery, a fingerprint reader and face unlock. The Telstra Superior is available now in Black for $199. “This new range delivers even more options as we continue to push the envelope to deliver Aussies access to the latest technology and design without having to break the bank,” added Skontos. For more information, visit https://www.telstra.com.au/mobile-phones/prepaid-mobiles/telstra-superior.